In Ohio, children know it's spring when their mommas take them strawberry picking. In Michigan, children know it's fall when daddy takes them to the apple orchard. In Utah, children know it's winter when their parents take them to the ski slopes. And in Texas, children know it's spring when the bluebonnets bloom. But they know summer is almost here when the dewberries are ripe! Dewberries are blackberries. Dewberries are not blackberries. Dewberries are a kind of blackberry. Dewberries are related to blackberries. Dewberries are black, and they are definitely berries. Dewberries are smaller than blackberries. Dewberries are larger than blackberries. Dewberries are the size of a berry. Dewberries grow on low spreading vines, as opposed to the high reaching canes of wild blackberries. Mostly. Dewberries have fewer stickers than blackberries. Dewberry vines are loaded with stickers. Dewberries grow along the side of the road, while blackberries come from a store. Dewberries taste just like blackberries. Dewberries taste different than blackberries. Dewberries are better for baking because they are tarter than a blackberry, and hold their shape better than a blackberry. Dewberries ripen earlier than blackberries. To preserve dewberries for year round enjoyment, first stake out your patch of roadside berries with barb-wire get lucky enough to find some along the road before someone else does. Then, rinse and freeze them on a cookie sheet. Or put them in a Ziploc bag and cover with water, then freeze the bag. Or, do whatever you would do to preserve blackberries. Despite all the differences in actual information, every native Texan I asked (or Southerner, as my Louisiana neighbors are pretty keen on them too) agreed in one respect: "Ooh, dewberries! When I was a kid..."
And being the awesome Texas parent that I am, I have given my kids my kids have discovered the joy of dewberries for themselves. Miss Boo was so proud to have discovered a patch of them and have us take an interest, that I was obligated to name our pie, Maren's Dewberry Pie. To which she responded, "You mean I get to eat the whole thing?" Uh, not exactly. But we will allow you to have a piece! Four and Twenty... Hundred... Dewberries... Baked in a Pie! The rest of us enjoyed Boo's discovery immensely. It's too bad they are not really blackberries, because blackberries are my favorite. I suppose these will do. When in Texas, do as the Texans do, and enjoy the heck out of every dewberry you can get your grubby little fingers on. I am now working on creative ways to bake with dewberries. 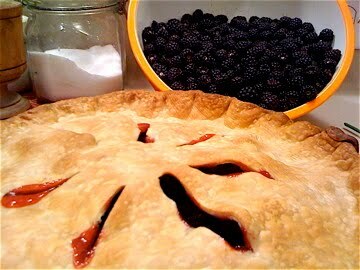 Dewberry Pie. Dewberry Cheesecake, Dewberry Cookie Bars, Dewberry Cobbler. I'm about dewberry cross-eyed, and deliriously happy to have discovered one more thing to love about Texas. In case you were counting, I used the word "Dewberry" thirty-one times in this post. Thirty-two. I wonder how long it will take for this page to show up on Google when you search for the term "Dewberry." Thirty-three. Probably a good place to stop. We have Wild Blackberries in Tennessee that grow like the dewberries do here. We would always pick them and east most before we got home to make pies, homemade blackberry icecream, jelly or whatever we wanted. LOVE THEM!! I was picking berries this weekend in the very back of my back yard and will head back out on Wednesday for the ones that had not quite turned yet.